May your barbecues and remembrances avoid sogginess. We’ll probably be cooped up indoors. It’s been raining here almost every day for close to three weeks now, and we’re starting to get a little worried about the warm weather crops. Lettuce is doing well, though, and I managed to get in my pepper crop between raindrops! I made a salad last night out of quick-grilled baby zucchini from the farmer’s market (local but grown in a greenhouse, so they don’t taste that great). It was simply dressed with lemon, olive oil, pine nuts and mint going wild in an unclaimed corner of my garden. 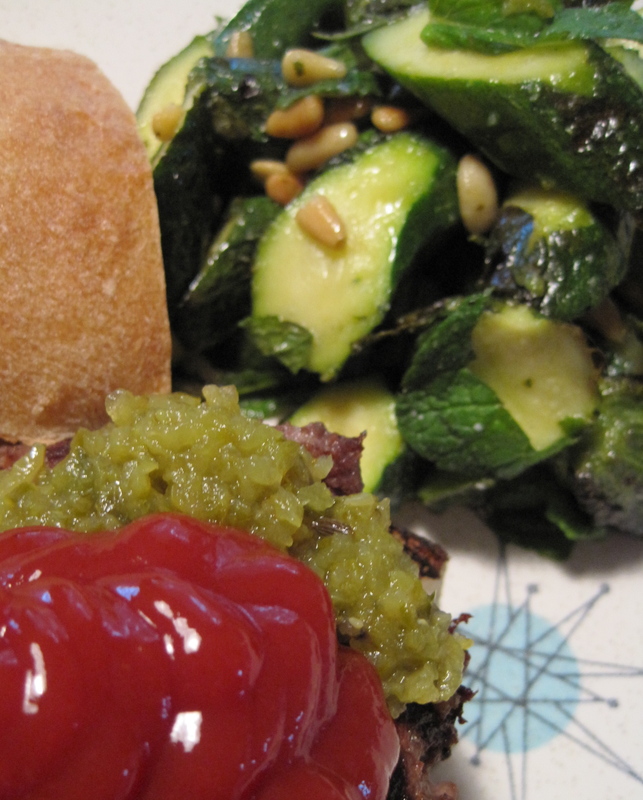 The local beef burgers with my dill relish and ketchup weren’t bad either. haskapberry jam — first berries of the season! I was so thrilled to pick my first crop of haskapberries yesterday! Yes, it’s the first berry crop of the season! Who knew? 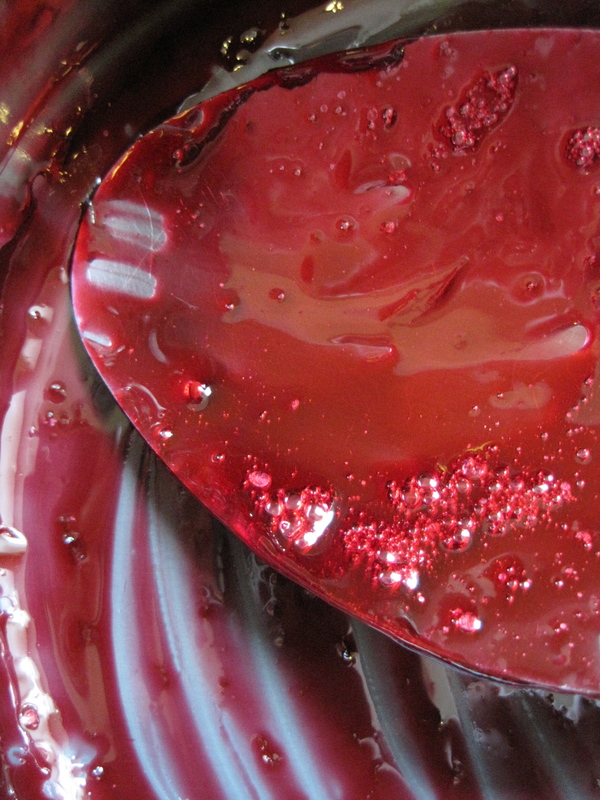 And, as I hoped in this post last year when I planted the bushes, the jam is absolutely marvelous. 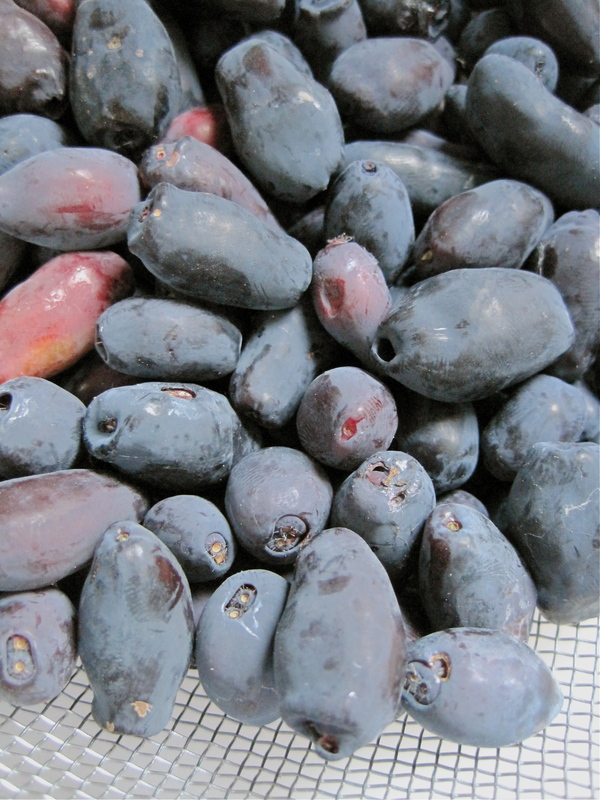 The berries look like elongated blueberries, but the flavor is much tarter and punchier and more wine-like than blueberries. They are the blueberries of the street: tough guys. Someone described the taste as a cross between a blueberry, black currant, and a black raspberry. I think that’s about right. But they aren’t sweet enough to eat without sugar — or at least mine aren’t. I have five bushes (one didn’t make it), all of slightly different strains that were part of the OSU trials. The plants weathered the freeze with ease, and apparently, will do just fine in the heat, as well. Some of my bushes produce hardly any berries, others produce many small, ovoid ones, and yet others produce the long fatties. Each one has a slightly different taste. I’m delighted by all of them. I didn’t have enough to make any standard jam recipe, my crop coming in just over a cup, so I improvised, knowing we’d eat this one fast and there would be no need to can the single half pint that would result. 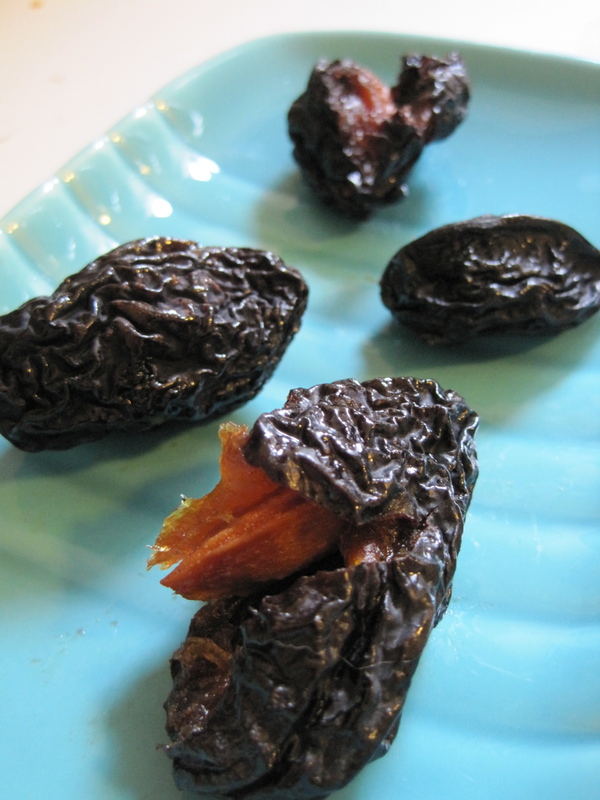 Below is an improvised no-pectin recipe one can use for tiny batches of any fruit, as long as you don’t mind 1) the sugar content; 2) not really knowing if you will have loose, syrupy jam, since pectin content varies in fruit; and 3) refrigerating the final product. I wash and sterilize my jars and lids/rings before using them, as the jam will be susceptible to mold growth after a while. That is, if you don’t gobble it up right away. Makes just over 1/2 pint. 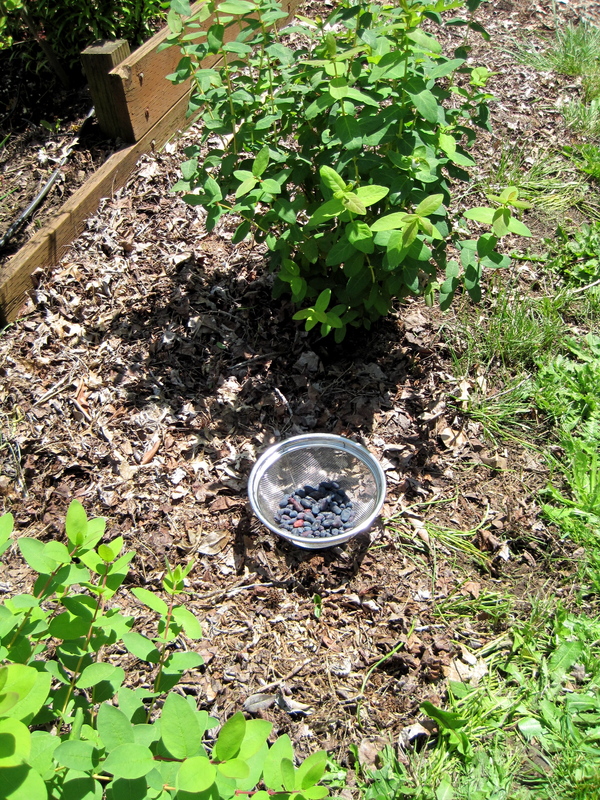 Remove leaves and debris from berries; rinse. Crush berries and add sugar and lemon juice in 3.5 quart (not smaller) saucepan. Boil ingredients until gelling point (see a preservation cookbook for instructions if you are unsure what this is). This will happen fast. Pour into sterilized 1/2 pint jar and cool. 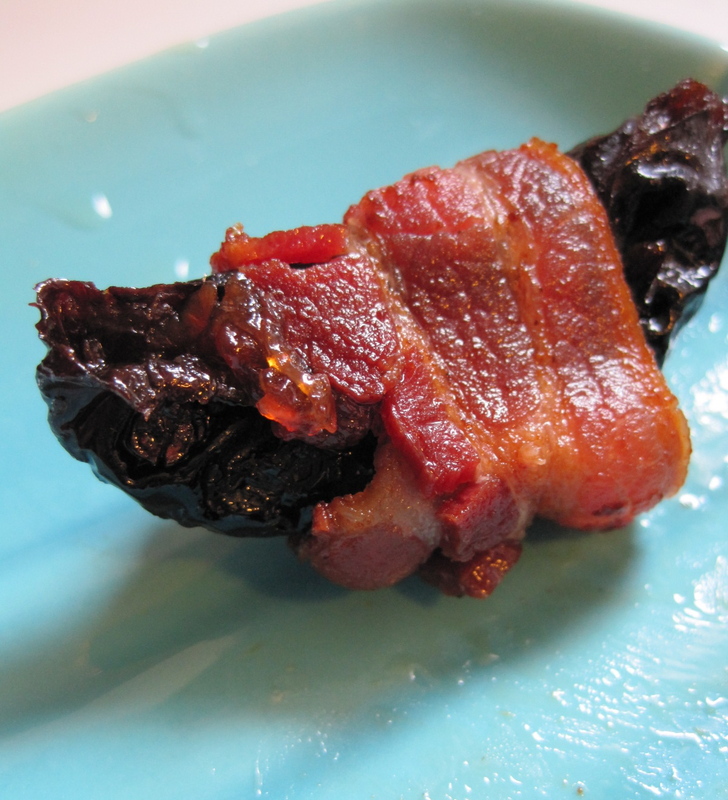 Refrigerate and consume within a couple of weeks. From the strawberry patch for Lane County locals: order your berry pails from Kiwanis ASAP! Orders must be postmarked by June 1. This is a longstanding fundraising campaign by the Emerald Empire Kiwanis Club. They arrange for local strawberry picking, cleaning, slicing, and delivery to Eugene. It’s the easiest way to get fresh strawberries in season that are ready to be used in all your fresh desserts, transformed into scrumptious jams, or frozen for use all year ’round. The proceeds go to local charities and programs that help children. Deliveries will be made to Valley River Center on June 24, and you can pre-purchase 15- or 30-lb. pails. Frozen blueberries, strawberries, raspberries and marionberries (smaller pails — for pickup in August) should also be ordered at this time. Lest you think it was all Jewish deli on those fine Balimorean shores, I had to post some of our shellfish eatin’. I don’t think the word “gorge” is too strong to describe what happened in Baltimore last weekend. In fact (vegetarians and allergists avert your eyes), it was a downright crustacean demolition derby. We started off the weekend at G&M Restaurant in Linthicum, the former hole-in-the-wall gone Big City with an expansion and spiffing up in the ten years we’ve been away from it. 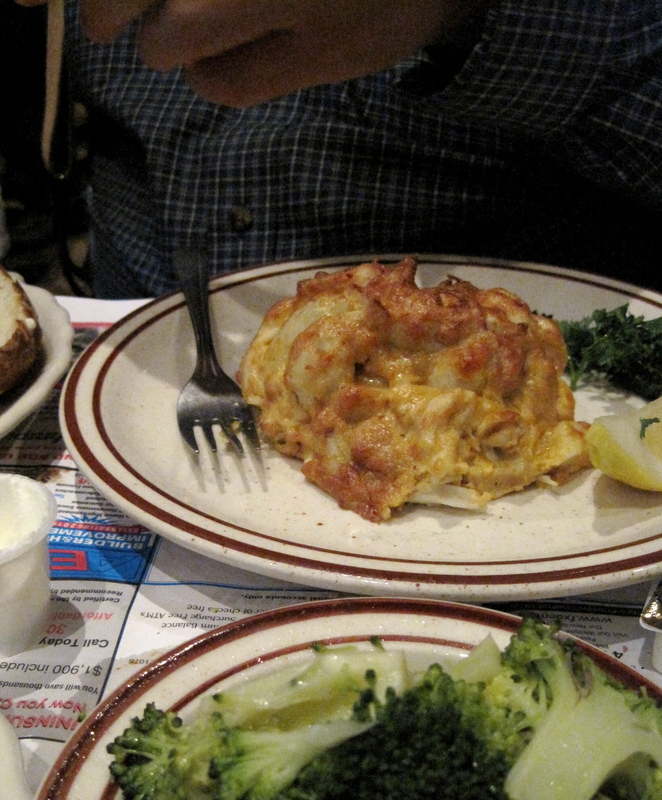 We’re not so sure we like the spiffing, but they still have crabcakes as big as a salad plate that are made up of lump crabmeat and a binding batter. No filler. None. As in a softball of large chunks of crab with a bit of eggy coating, served simply with lemon. One is enough, and don’t bother with the anemic sides or stale rolls. Instead, focus on the seafood. 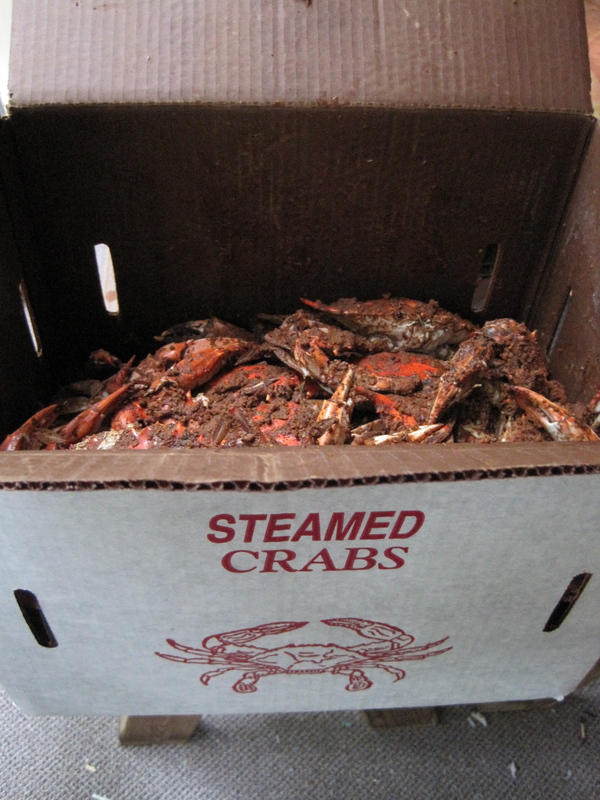 Why just eat crabcakes, when you can also have Maryland crab soup and a shrimp boil? We shared a bowl of (rather undistinguished) soup that seemed light on the crab to me, more of a tomato soup with frozen peas, corn, and limas than anything else, slopped over the side of the bowl. 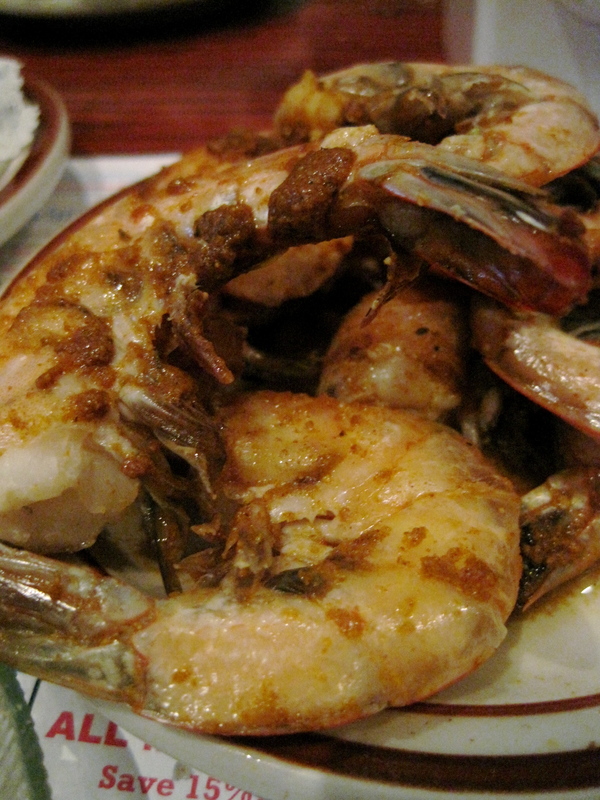 But the shrimp were good — slightly dusted with Old Bay seasoning from the boil, large and delicious. But clearly, we were holding back for the big event. For my father-in-law’s 80th birthday party, a gala family event, we ordered the finest crab preparation in the world, Maryland blue crabs steamed with Old Bay. Soooo good. See that mud? It’s not mud. It’s Old Bay. To eat the crabs, you crack them open and eat the sweet, soft flesh while licking the Old Bay off your fingers. No need for butter or tartar sauce or anything like that. It’s just you and the spicy, salty sea. 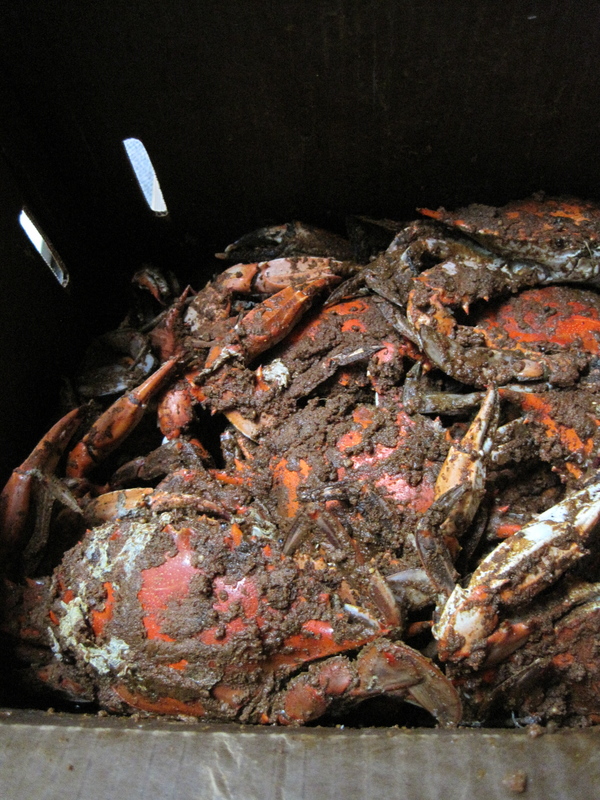 Even with the questionable origins of the crabs (the Chesapeake has been polluted and the crabs usually come from farther south, and you know what’s going on with southern waters right now), I have to say that blue crabs beat the pants off our western dungeness crabs. The meat is almost silky, and the large crabs don’t result in the stringy, bland meat that dungeness sometimes do. And no one in Maryland insists on chilling (!) the crabs like we do here. The boys brought home a sampler of coddies, the little seafood cakes that are another specialty of Baltimore, and I sliced up a dozen deli pickles (green, “well-done,” and green tomato). My sister-in-law made a creamy dilled potato salad that I’m dying to try out for summer barbecues. It was meant to go with the crabs, but we were so crustacean-drunk we didn’t eat much. All the better — we could eat it for a couple of days for lunch and snacks. Once I calibrate the proportions, I’ll post a recipe, but the basic ingredients were potatoes, fresh dill, red onion, cucumber, Greek yogurt and mayonnaise. Yum. And as drunk as we were on Old Bay, we topped it all off with springy, fruity rosé wine from California and Oregon (and crummy beer, pictured below). My contributions to this entire feast were minimal, I’m afraid. I’ve been so busy that I’m just not able to do much else other than work, and I took the opportunity of our trip to spend a wonderfully exhausting day at the Barnes archive at University of Maryland. 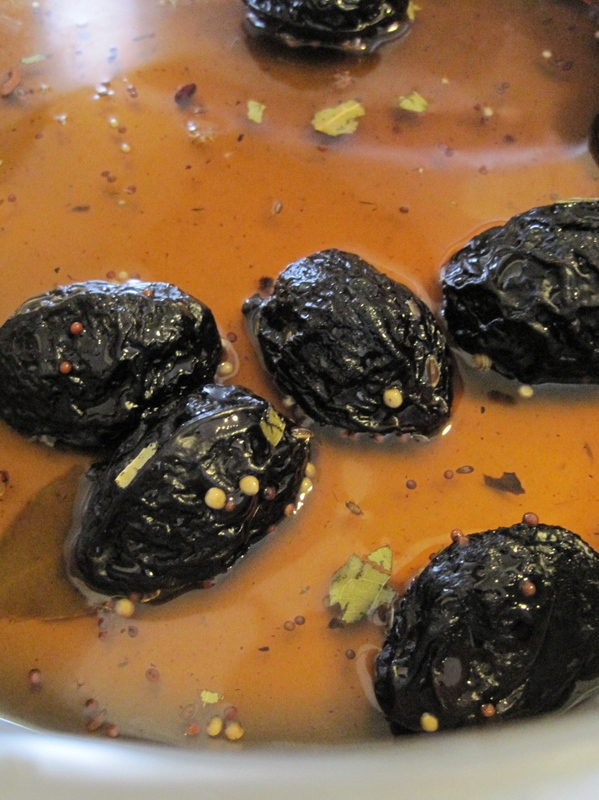 I did bring some hazelnuts and Brooks prunes to represent our ‘hood, and made Linda Ziedrich’s pickled prunes, but other than that, I just served as kitchen help and a shopper, and spent a lot of time on my laptop putting out fires. But back to the crustaceans. We had so much fun eating shellfish that we ordered lobsters a couple nights later and did it all again, even though lobster isn’t exactly a Baltimore tradition. I, for one, was willing to overlook that. We had them with drawn butter and homemade mayonnaise, and they were fabulous. My genius sister-in-law made crèpes for dessert, and I really regretted not being able to pack my remaining few jars of 2009 jam. I didn’t take pictures, because by then I could barely move. Howdy, Eugeniuses! I’m writing to you from the wrong coast, the first of many long-distance trips I’ll be making in the next few months. As you’ve probably noticed, I haven’t been posting many recipes and food-substantial posts lately. My blogging has been like my cooking — I manage to squeeze in a few steps of a multi-step process, then just can’t finish. So I have photos and experiences and notes, but no time to finish off something palatable for general consumption. So everything goes in the compost pile. Them’s the breaks. I’m finishing the last few weeks of my first year of employment as a professor, and it’s been a tough term administratively, with increased demands on my time from all quarters: teaching, emailing/form-filling/grant-applying, researching, writing. All I want to do when I get home is fall asleep, not wrestle with raw meat, bread dough, unwashed greens, unroasted peppers, unmashed potatoes, etc. But with the school year ending imminently, I am excited to spend more time with my great love, food. I organized a special session panel on literature, food, and desire, for my discipline’s big conference (the MLA convention in January 2011), and it was accepted! I’ll be presenting on the iconic fruits of modern literature. To prepare, I’m going to Zurich, Switzerland, in August to take part in a workshop on James Joyce and food. And tomorrow, I’ll be at the University of Maryland archives researching the little-known food journalism of another modernist, Djuna Barnes. For yes, I’m in Baltimore! My husband grew up here, and we lived here for a couple of years together. He knows the city far better than I do, but what I do know is that eating Jewish deli is one of my favorite things in the world. So why do I look so crabby? Well, it’s not the crabs. And we’ve had our fill of crabs. I’ll fill you in on another post. It’s the Jewish deli. 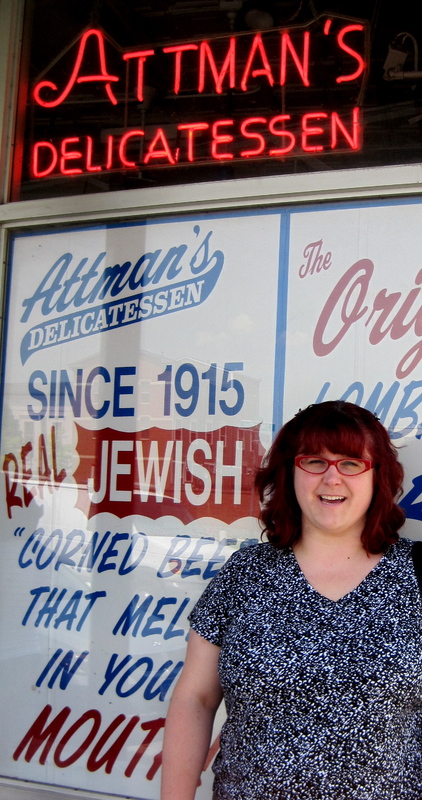 I’ve written about Jewish deli before, even scooping the NYT on a story on new Jewish deli. But I have to say that I’m absolutely floored by the oldest, probably least sustainable (?) 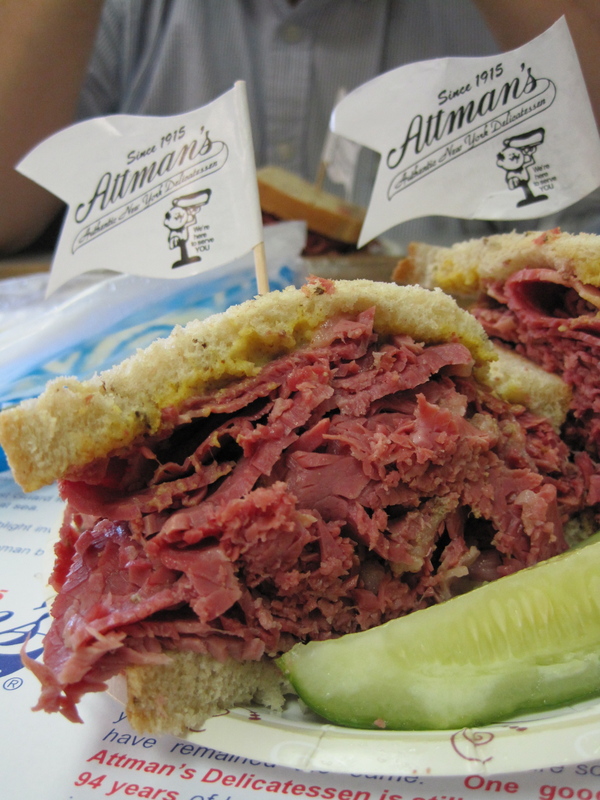 Jewish deli techniques I’ve found back in Baltimore. Because they are SO GOOD. 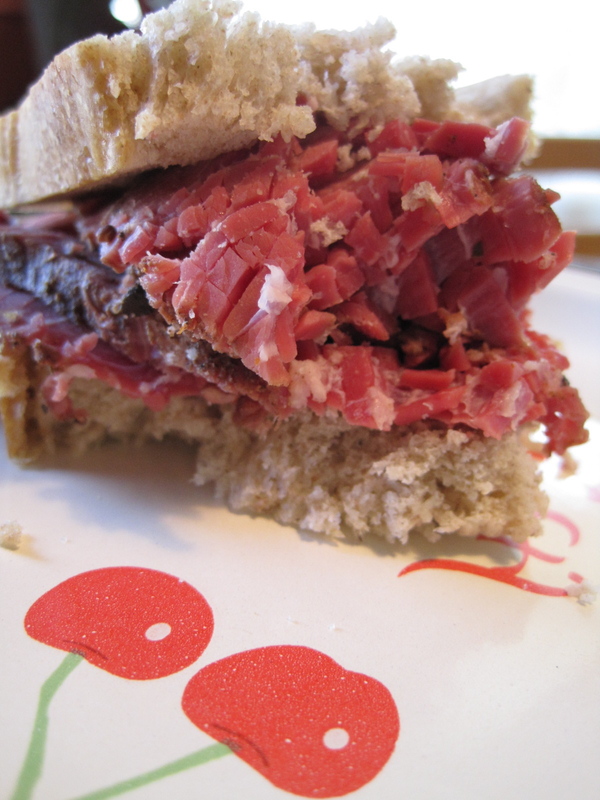 Now, I make a pretty good corned beef. This one from last month was made from well-aged (i.e., a near save from rottenness; see paragraph one), local grassfed beef, so it doesn’t get much better than that. Can I even tell you how hard it was for me to concentrate, what with the crooked picture setting off my OCD tendencies, the vintage self-named host chatting up the old ladies about Our Greatest Generation and “Kids Today…” and a homemade model of the H.M.S. Bounty (courtesy of said gentleman) and the mustard and the sign telling you how to order (Corned beef. Rye. Mustard.) (and the menu charging you extra for tomato and lettuce and othersuch nonsense) and the tubs of pickles. Pickles! Green tomato, sour pickle, green new pickles. Sauerkraut. And Jewish deli pickles drive me mad. MAD! I can taste how they are different from mine (above, in their clean, West coast jar, bubbling away) and it’s maddening. God. It’s like I’m missing an entire range of subtle flavors and I don’t know how to get them. Don’t know if it’s POSSIBLE to get them when you’re pickling in a glass jar and you don’t have the aged must of pickle fairy dust seeping from the barrels into your murky, menschy brine. 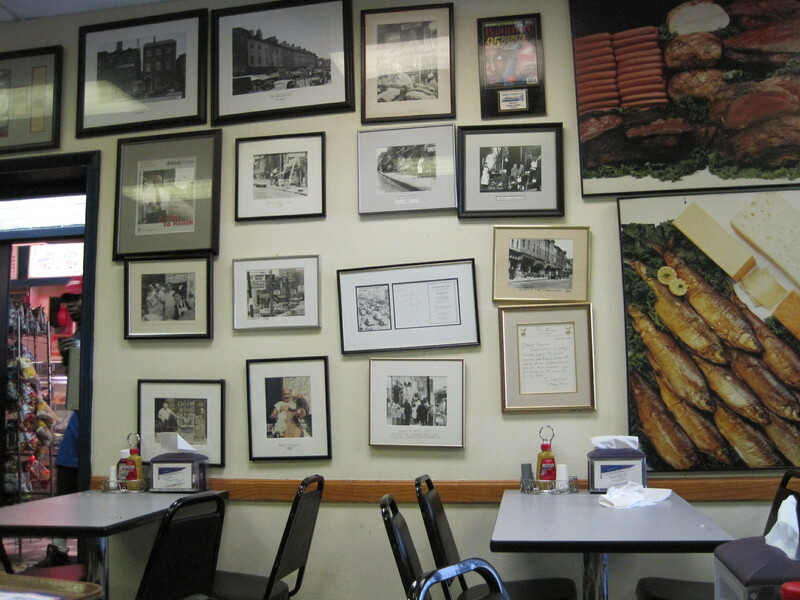 We went to Miller’s deli in Pikesville the next day. 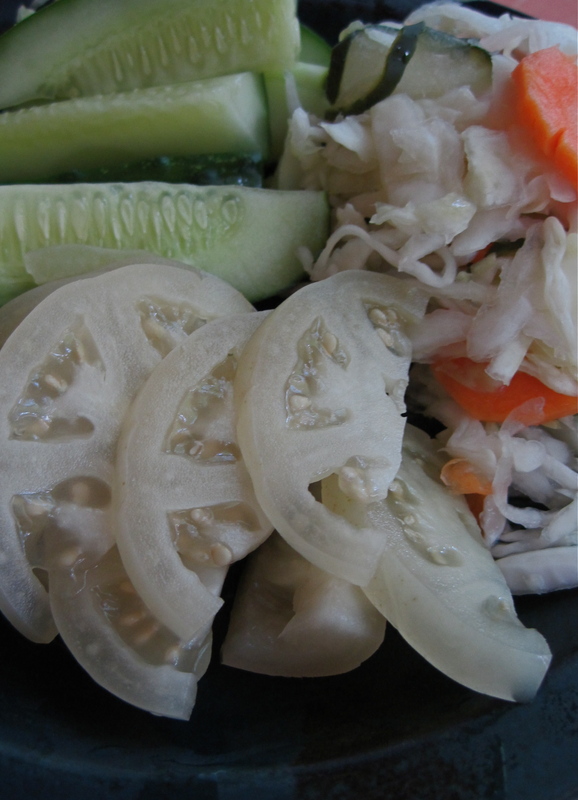 I wasn’t that hungry, but I had to buy an assortment, including green tomatoes and “health salad,” a quick-pickled cabbage, cucumber, and carrot salad made with vinegar, water, salt, and sugar. To my health! Gobbled them down (with the help of relatives, of course). But not before I inspected every inch of that bright green new pickle. Holes to let in brine? NO! Fermentation fizz? NO! Bright salt as a predominant flavor? NO! 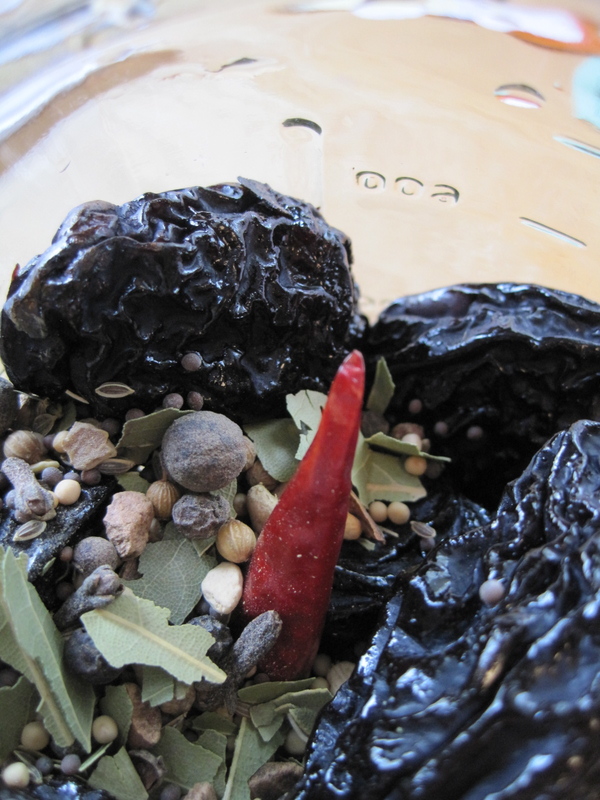 Signs of pickling at higher, lower temperatures? NO! Partial pickling? NO! Vinegar? NO! Smaller cukes? NO! (Huge, in fact.) Lots of garlic? NO! Then what? 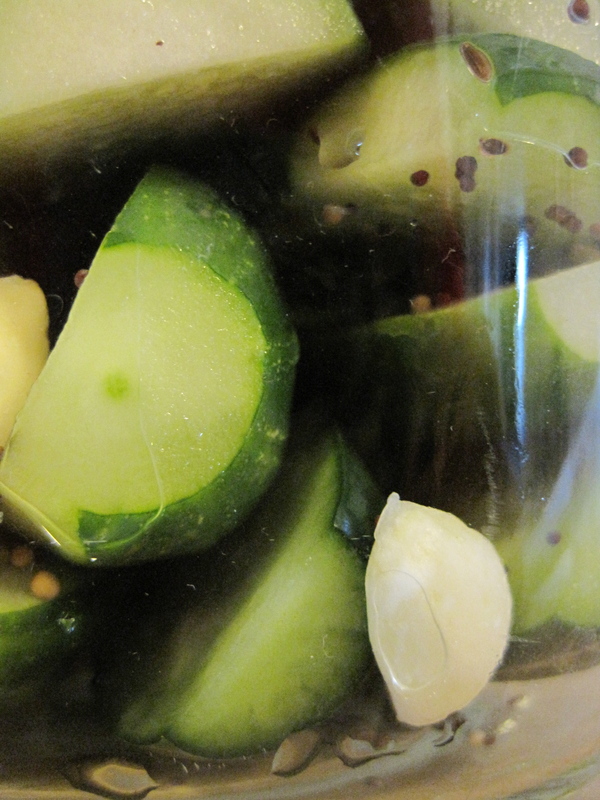 The pickle is new, but the brine tastes old, mostly of well-integrated pickling spice, hefty garlic but not all garlic, and not all that salty. Not much dill. Then what? I am flummoxed. Flummoxed. O the secret society of the Jews and their magic preservation techniques. Help meeeee! It’s blackberry cobbler, really, but I’m gobbling it up so fast I wonder if we should change the name. 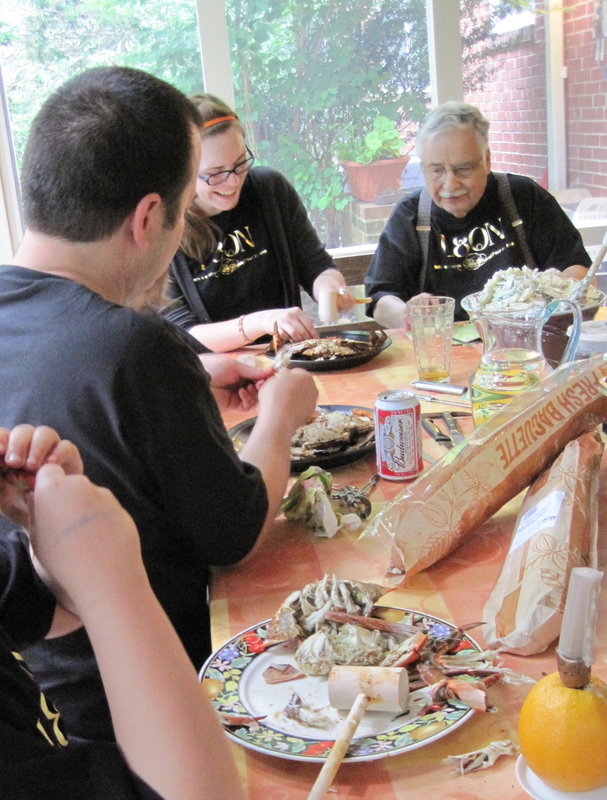 I’ve transitioned into making room for the 2010 preservaganza by eating up all the fruits of my canning labors in 2009. I love this time of year because everything seems luxurious when you use up the end of last year’s season. The cobbler, for example, was downright over the top with two pints of homemade blackberry pie filling juiced up with a few cubes of frozen fresh boysenberry-cassis-rose geranium coulis. I also have enough frozen berries (thanks to Lara! hi Lara!) to make another few batches of jam to get me through to July. 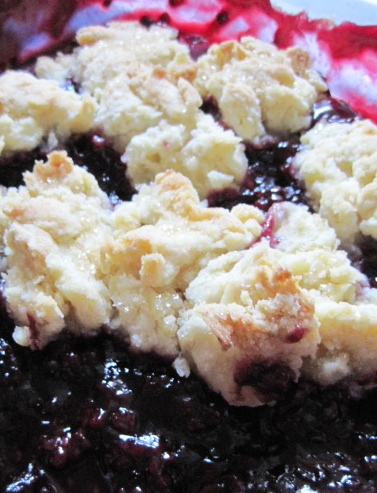 My cobbler recipe, a not-very-sweet, biscuity version, is slightly adapted from Ree Drummond’s blackberry cobbler #2. (Recipe can be found in a more readable form at the end of the post if you want to avoid the images.) She prefers the moister, sweeter, cakey version, but I’m a big fan of biscuit topping, since there’s so much more control over the sweetness factor. I also don’t serve it with ice cream, the sacrilege! But you might want to, if you need the sweetness. Either way, if you have 6 cups of frozen berries (or a quart of home-canned pie filling, which will make it a bit more viscous), it’s a great recipe for a bit of summer in early spring.